After two beautiful days of sun and highs in the 60’s and low 70’s on Monday and Tuesday, the weather in southern Minnesota has changed drastically as Old Man Winter attempts to give us one last stubborn, icy breath. Cold rain yesterday gave way to blustery winds last night and into today, and late tonight/early tomorrow (Saturday) there is a chance of snow showers. Fear not, however; no accumulations are expected, and high temperatures are expected to reach near 50 degrees Fahrenheit even tomorrow afternoon. More rain is on the horizon for several days next week as daily high temperatures will gradually increase toward the 60 degrees Fahrenheit mark by next weekend. Despite the current low temperatures, the Linnaeus Arboretum is looking as it usually does in mid-April. The recent rains have intensely greened up the lawns of Kentucky bluegrass, and most trees are showing swelling buds near bursting. Crocuses are blooming across campus in garden beds (especially near Christ Chapel and the Jackson Campus Center), and daffodils have begun opening in their usual location under the tamaracks on the north side of the Jim Gilbert Teaching Pond. New growth can be found throughout both the Coneflower and Uhler prairies, and tulips, only a week or so away from showing their wide array of colors, are adding quite a bit of greenery to the perennial gardens behind the Interpretive Center. 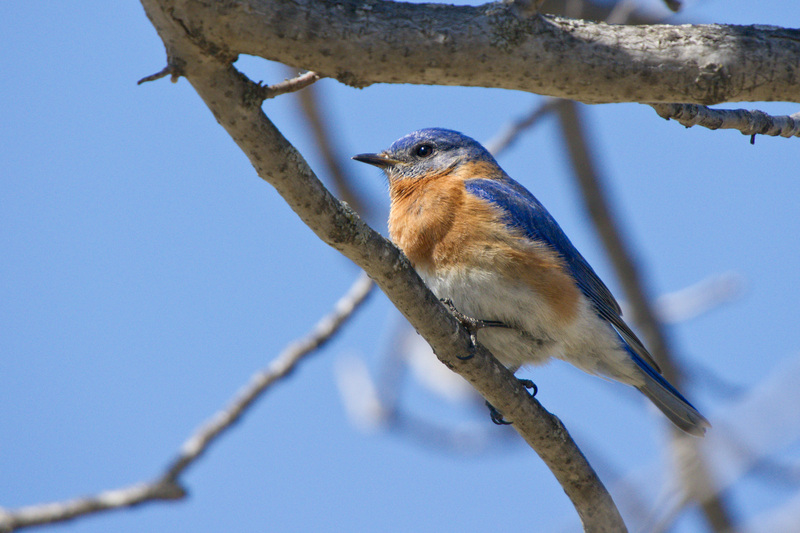 Male Eastern Bluebird perched near bluebird house in southwest corner of Arb, 4/12/11.